Regretfully I cannot be among the interested parties who will witness a sunrise ceremony on Toronto's western waterfront on April 27th. Travel plans waive my participation and a blog posting that day, but I will be there in spirit. It's a memorial gathering for the day two hundred years ago when the invading fleet sat poised at dawn to take our town. Then "Walking in their Footsteps" will subsequently trace the American advance from their landing to the garrison. 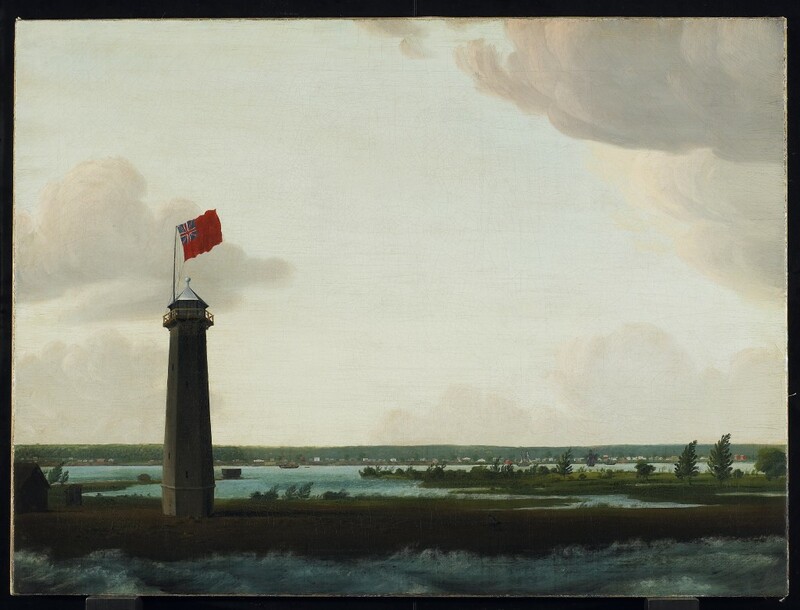 As Admiral Chauncey's fourteen ships approached Gibraltar Point from the east the day before, they would have had a view like this. 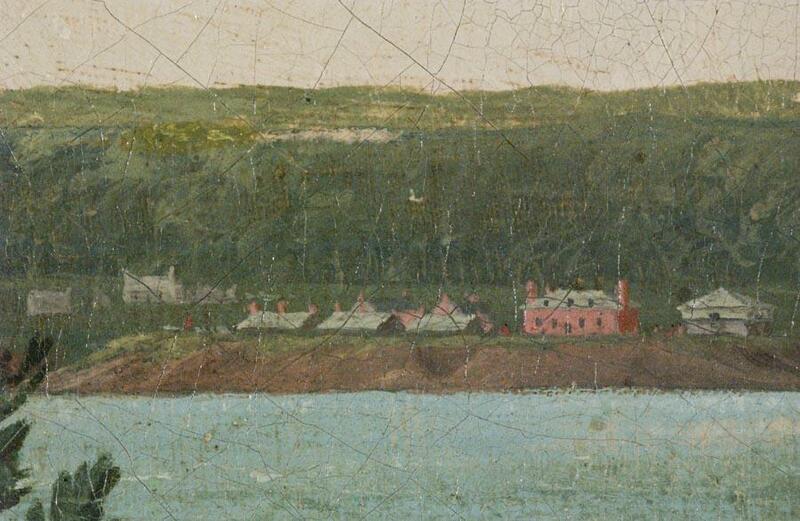 Robert Irvine’s "View of York" painted ca.1816 (Art Gallery of Ontario, ID 2946; a gift from descendants of the late Mrs Stephen Heward). By no means have I read all the excellent books about the War of 1812 and the Battle of York but I'd highly recommend Robert Malcolmson's Capital in Flames: The American Attack on York, 1813 (Montreal: Robin Brass Studio, 2008). Apparently a paperback edition is in the works. And the newsletter of the Friends of Fort York, The Fife and Drum, vol. 17, no. 1 (March 2013) is crammed full of bicentennial details. I am SO going to miss "There's a Great Day Coming"! In every war, and perhaps every battle, on both sides there are missteps, mistakes, miscalculations, fumbles and stumbles, besides the unpredictable outcome and human consequences. The little colonial town of York, even though it was the capital of Upper Canada, for various reasons was not best prepared for defence. It had never been designated a military post per se. What would I blog about anyway, if I were here on April 27th? It's rather pointless to regurgitate what I think of as classroom history even if I pretended to be a historian. Truth is, I don't know if "history" is formally or otherwise taught anymore in elementary and higher public education. Its relegation in some provinces into social studies is disquieting ... "socials," as coined by the youngsters, who, by the age of fourteen, seem to know zip-all about the founding of this country or its geography. 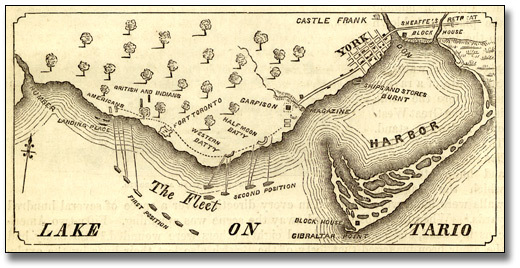 ■ The British decision to blow up the grand magazine of some 30,000 lbs of ammunition at about 1:30 pm caused a massive shock felt all the way across Lake Ontario, shaking buildings in Niagara. An estimated thirty-nine American troops were killed and over two hundred combatants dreadfully wounded. ■ Not long after this disaster, under orders from retreating General Sir Roger Sheaffe, Col. William Chewett and Major William Allen of the 3rd regiment, York Militia, with Rev. John Strachan, presented themselves to Col. Cromwell Pearce for the surrender of York. ■ Doctors―Baldwin, Beaumont, Aspinwall, and others—worked non-stop at the garrison with the ghastly casualties; some of the injured from both sides were billeted in town homes and lodgings. ■ General Zebulon Pike soon died of his injuries. Malcomson says his remains were preserved in a cask of liquor for a return trip to Sackets Harbor; in days gone by this was not an unusual way to transport a corpse. ■ When the Americans seized correspondence and personal effects left behind by hastily retreating British military officers, General Dearborn took great pleasure in using Sheaffe's musical snuff box. ■ Despite property protection in the terms of capitulation, shops and houses were ransacked at will, some repetitively; no-one stopped the ransacking and general madness for three days until American commanders finally acknowledged the pleas of town officials. ■ I have never been able to determine if the stolen fire engine still exists in an American museum, or if the story is apochryphal. ■ Some "fraternization" with the enemy occurred due to many cross-border family and commercial bonds; some Canadians benefited from hauling off wharfside swag, all of which the Americans could not load onto their ships. ■ Some militiamen who had not participated at the battle came to the garrison to obtain parole in the belief it would exempt them from future duty; the Americans duly recorded them. ■ Ultimately, most of the garrison and the parliament buildings were torched. ■ A human scalp had been on display next to the ceremonial mace in the parliament buildings; it was sent along with other trophies to the U.S. naval department. The mace was given back to Ontario by President Roosevelt in 1934. ■ While some Upper Canada government loot was eventually returned, the U.S. navy still possesses the large carved wooden lion that decorated the speaker's chair in the Legislative Assembly. Truly a face to ponder! 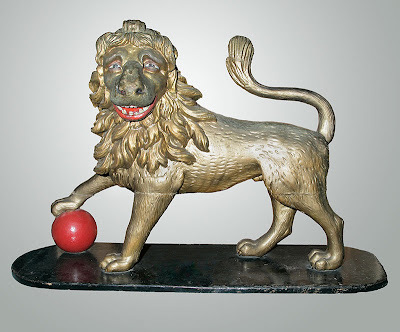 Original at the United States Naval Academy Museum, Annapolis, Maryland; the image itself is from the website of the Canadian War Museum which appears to be exhibiting a facsimile. The War of 1812 memorial at Victoria Square in Toronto sits in the old military burial ground at Wellington and Portland Streets. Few grave markers survive from the early days of York. The fallen soldiers and militiamen are represented by the figure known as the "Old Soldier." Stephen Otto, "The Thomsons: Early Builders at Fort York," The Fife and Drum [Newsletter of The Friends of Fort York] (http://www.fortyork.ca/resources/newsletter-archive.html : accessed 11 December 2012) vol. 14, no. 2, July 2010. Artifacts in the Kasbah Museum in the town of Sousse, Tunisia, had me gaping in astonishment. Sousse is one of Tunisia's Mediterranean coastal towns existing since eons BC. It became a thriving Phoenician (aka Carthaginian) trading post and then an indispensable port into the Roman province of "Africa." It was attacked by Vandals and Berbers and occupied by the Byzantines before the 9th century Arab conquest. The mediaeval walls of the Sousse medina, a World Heritage site, were built for protection against further waves of attack by Normans, Ottomans, Spaniards, and French. Today they enclose a vibrant life that seems little changed since then. The only minor damage sustained in five hundred years occurred during a sea bombardment during the Second World War. Sousse was home to early Christians whom the Romans originally oppressed and persecuted. As in other parts of the empire, Christians resorted to burying their dead in underground catacombs away from the eyes of authority. They were by no means the first to employ this practice; remains and items of the Carthaginians preceded them, and probably others. Outside the walls are fifteen kilometres of catacomb tunnels with something like 15,000 burials. Rediscovered in the 19th century, only a tiny portion has been excavated and restored. The splendid museum is located in the kasbah, high in a strategic corner of the medina walls befitting its first function as a military fortress. The kasbah itself is beautifully designed and proportioned, and the museum architecturally complements it to dramatic effect. Highlights are the spectacular mosaics created as floor decorations in the Roman homes of Sousse, then called Hadrumetum. They are displayed vertically for best (overwhelming, actually) effect, many of them room-size, some in fragments. Greek and Roman mythology are the main artistic themes, with occasional scenes of hunting, fishing, and daily life. Most stunning of all: what looks like a typical Roman communal bath, with incredibly beautiful mosaics, is a 6th-century Christian immersion baptismal font. The Latin inscribed around the edge is Gloria in excelsis deo, et in terra pax [h]ominibus bone, bolum[itatus l]audamus te (glory to God in the highest and peace on earth to men of good will, we praise Thee). But to the point: the museum also exhibits a number of fascinating funerary and burial-related objects from the catacombs. Viewing marble epitaphs for Byzantine Christians of the 4th century was awesome enough but some of the pagan Roman stelae date back to the 1st century AD. Most of them commend the departed to the household gods (dis manibus sacrum - DSM) so containers and food for a meal were deposited with them. A stela usually gives the person's name, age, parents, status, and name of the person who erected the stone. The date of death does not seem to be the norm! What amazed me was the antiquity of the stones and that the inscriptions could have survived so long―we are accustomed to most cemetery markers being worn away by weather elements after a few hundred years. Being "stored" underground likely helped preserve them. Time at the Kasbah Museum was priceless, worth getting lost trying to find it through the twisting medina alleys and steep climbs!